CHIMURENGA musician, Thomas “Mukanya” Mapfumo, who returned home on Wednesday, is grateful to the new dispensation for their efforts to bring back the country’s lost glory. After living in self-imposed exile in the USA for the past 14 years, an outspoken Mukanya said he never thought he would return to Zimbabwe. “I’d like to thank you all for the warm reception you gave me. I spent a lot of years, 14 years, in a foreign land which was no joke. I’m grateful to the Almighty and the ancestors who protected me while I was out there. “I didn’t think I’d come back because of the way things were being handled here. If it was still the old system and if the old man was still in power, I wouldn’t be here, but I’m glad I’m here,” said Mukanya during a Press conference held for him at the Crowne Plaza in Harare yesterday. He said he would love to meet President Emmerson Mnangagwa and MDC-T leader Nelson Chamisa. “We’re one. We are the same people so this is why I’d love to meet both leaders. Africans should unite,” said Mukanya. If he were to meet former President Robert Mugabe, Mukanya said he would simply tell him that he messed up. 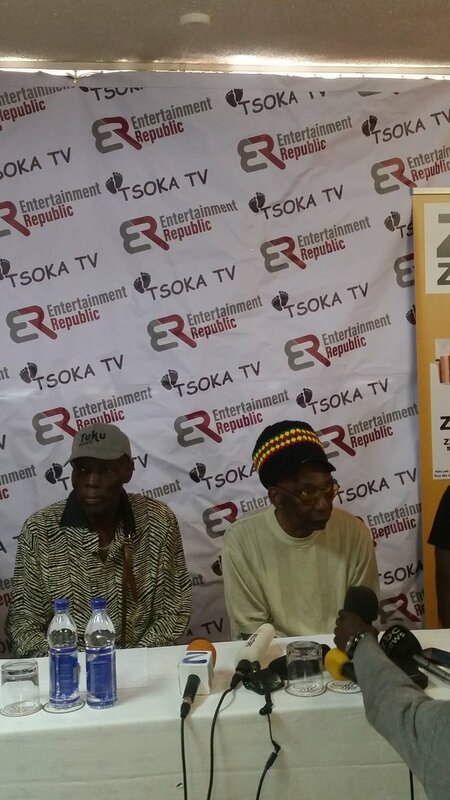 Thomas Mapfumo is in the country at the invitation of Entertainment Republic, who have organised a show that has been dubbed “The Big Bira”. It will be held at the Glamis Stadium in Harare next Saturday. Mapfumo urged youths to unite saying the future of Zimbabwe lies in their hands. “You the young ones, I’m requesting you to take charge and speak up. Don’t be afraid when you see something bad as you are the one’s who’ll remain here after we’re gone. Be nice to others and help where you can otherwise the country will be in shambles. On the local music scene, Mukanya, who will be sharing the stage with Oliver “Tuku” Mtukudzi, Gary Tight, Andy Muridzo and Sulumani Chimbetu among others, said he was willing to work with local artistes. “I’m willing to work with anybody. Right now on the CD, Chauya Chauya, that I’m working on, I collaborated with a young Zimbabwean girl from Bulawayo, Rati Dangarembwa. Most of you here don’t know her. On collaborating with Tuku, Mukanya said it was in the pipeline. On his performance next Saturday, he said: “I have a lot of stuff that you guys here have never listened to. Music keeps changing, if you’re a composer or musician, you keep coming up with different ideas. I listen to hip hop, dancehall and jazz among other genres so I get ideas to come up with something new,” Mukanya said. In apparent reference to artistes like Jah Prayzah, Mukanya said they should not grow big heads when they win international awards. He said people should also desist from comparing artistes as they are not in competition. On the new crop of artistes, Mapfumo said they were struggling to make it because they lacked identity. “They say they do dancehall, do they know what it is? Dancehall is a Jamaican word so once one gets into that genre, they have to start imitating the culture so that they can be entertained like the Jamaican artistes are. “Now, Zimdancehall here, they don’t know it there (Jamaica). Artistes need to produce music that’ll go across borders like Lucky Dube who did reggae and crossed borders. If you want to imitate, imitate everything,” said Mapfumo. As such, he said, there was a need for him to meet decision makers to discuss the country’s arts and culture. “People are recording stuff and immediately, it’ll be on the streets being sold for a dollar. People are killing the industry because of this piracy behaviour and the artistes who will have worked are not getting anything. Speaking at the same press conference, Oliver Tuku Mtukudzi, who will be sharing the stage with Mukanya next Saturday, said he was overjoyed that his “brother” was back in the country. He concurred with Mukanya saying Zimbabweans need to realise that they possess a lot of talent and support each other in order for the arts industry to thrive. “Here, we look down upon ourselves and praise others. We must be proud of ourselves because we’re very talented. If we listen to our elders and the government, we’ll go far,” said Tuku.